What you think of Moonlite focusers? I am getting a scope with a Moonlite focuser. Never had one before. This is the CF2 model with the tri knob and with shaft lock. So how good are these? You will love it, they are built like tanks and can hold quite a bit of weight and won't budge. I think the thing I liked them about the most is that you can adjust the tension on the tube so you can tune the smoothness of the movement to your liking. Keep in mind that adjusting this will reduce the amount of weight the focuser can hold if you loosen it. I have one on my 10 and 15-inch Dobs,, they are very well built and are adaptable to a huge range of telescopes. They have no difficultly handling a Paracorr and a 30mm Explore Scientific 82 degree eyepiece, which together is almost three pounds. The operation is very smooth and precise. For a standard Crayford, they are good, but still have the limitations of many standard Crayford focuser, which is that the bearings ride on the anodized tube wall rather than steel rails, and the pinion shaft can deflect on its bearing under heavy loads. For standard use, they are great, but for heavy duty service (for example, when using binoviewers) I recommend s design where the bearings ride on steel tracks that support all of the load rather than force the pinion to carry half the load. Since it was on the scope, there was no decision making required and I am sure it will for fine, but heavy duty service, it does have limits and there are better designs on the market. Edited by Eddgie, 24 March 2019 - 08:04 AM. No complaints and Ron offers exceptional service. I also like FT but these are far more costly IME. Love mine, and yes, Ron provides amazing service. Sounds like a winner guys. I don't plan on any heavy loads as most of what i use is 1.25" eyepieces 90% of the time. Do have one 30mm 2" ES and that is it for heavy stuff. Bang for the buck, you cannot do better. If you want to spend and spend, then that is possible. But why spend extra money? Put the extra dollars on a new eyepiece. And Ron provides great service. OP asked how good they were. I would say that they are very good, but not the best for extreme duty. While most might not not have used the focuser in these kinds of service applications, I have, and under heavy duty service, mine kept suffering rubbery focusing, bearing failure and eventually a scarred focuser tube. Once the tube is scarred badly, it has to be replaced. Here is the problem with the standard design. 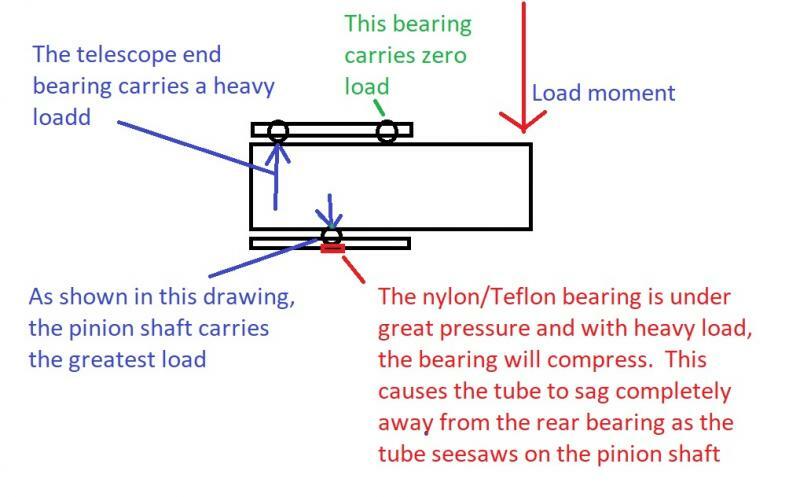 Half the load is applied to the front bearings and half the load is applied to the pinion shaft, which then transmits the load to the nylon support bearing. This bearing is under a lot of compression and to keep the pinion shaft in solid contact with the flat on the tube, the pressure on the bearing backing plate needs to be increased. What this does is causes the pre-load spring to have trouble holding the reduction bearing gear faces together with sufficient force to grip. This means that a heavier duty pre-load spring has to be used (and in fact, Moonlight does use a heavier preload spring in the refractor versions than in the Newtonian versions). When the support bearing backing plate has a lot of pressure on it, the motion of the focuser becomes spongy and you use the one really great benefit of the Crayford design, which is the butter smooth focusing. If the load gets heavy enough, what happens is that by the time you get sufficient tension on the pinion bearing backing plate to keep the tube from deflecting away from the load end bearings, the focuser motion of the slow speed knob becomes very rubbery and imprecise, and even with a lot of tension on the preload spring, you can still experience slippage. Again, this is not a problem that most people will encounter, but the OPs question was about how good the Moonlight Focuser is, and for heavy duty service, my own direct experience is that it is not as good as other, more modern designs, which use steel tracks and bearings that take the load from the pinion. For example, the Feathertouch that put in after the second failure of the Moonlight buttery smooth when the exact same load was used. In the Feathertouch, the bearings all ride on steel tracks that support all of the load, and the pinion shaft only has to have enough pressure on the backing bearing to keep it from slipping, and this only requires little pressure. Rack and Pinion Focusers also handle load better than standard Crayford. The Moonlight is one of the better standard Crayford focusers out there and their costomer service is excellent, but the OP asked how good the focuser is, an my answer was that it was very good, but not the best for heavy service loads like binoviewers. And Moonlight used to sell a focuser with double bearing and that helps reduce bearing failure, but the problem is not just the bearing failure, it is the fact that the pinion carries a great deal of the load, and the pinion backing bearing still has to support the same load. This is the weakness in the design of the standard Crayford (not just Moonlight, but all of them). Modern designs unload the pinion by having the rear bearings take the load from the pinion. So, everyone can have a love fest on Moonlight and that is fine, but the OPs question was not how much people love them, but he asked how good they were. My answer was that they are very good, but not in my own experience, the best for heavy duty service. Now if the OP had simply asked how many people love their Moonlight focusers, I would not have even responded. That is a rah-rah question and I try to avoid those kinds of threads. Edited by Eddgie, 24 March 2019 - 09:01 AM. Thanks for the great info. As i said , i will only use 1.25" stuff 90% of the time. Only heavy eyepiece i have is a 2" 30mm ES. I don't image at all. It just happens that the scope i am buying has a Moonlight focuser and i have never owned one before. Had many Feather touch over the years on my Dobs. Edited by CHASLX200, 24 March 2019 - 09:11 AM. My Moonlite 2" refractor focuser has not been the same since I tried a 12mm ES92 in it. Eventually I will get a FT. Adding my support for the Moonlite love fest. I love them because I think they're the best reasonably-priced focusers on the market and Moonlite's customer support is among the best I've known from any manufacturer I've ever done business with. I among probably a number of others here can certainly appreciate the detailed lesson on heavy-duty focusers from an engineering perspective, but whether or not Moonlite focusers were the best for "extreme duty" or "heavy-duty service" was never part of the OP's question. He simply asked how good they are. I may know this week if i can pick up the scope. My Moonlite focuser tube developed a scarred foucser tube (as described above). Ron replaced the tube at no cost. The second tube is developing some scarring, but I have kept this to a minimum. The appearance is not perfect, but the focuser works fine. in fact, I like it a lot. But on my second telescope I specified the Feathertouch. The FT is awesome, but at an awesome price. I guess you get what you pay for. The service at Moonlite is outstanding. My Moonlite came on a scope I bought. I swapped it onto my 120mm ED but it had been damaged in transit so I had Ron service it, well worth the cost. I am getting the scope this week so we will see how like the Moonlite. The owner says it super. Having owned far too telescopes with focusers ranging from cheasy to bad to not bad I have to say that I much prefer the higher end focusers. While I would have to conclude that while the Starlight Instruments are the creme-dele-creme and super deluxe and beautiful...they are pricey. Are they worth it, I will leave it up to you to decide. I have so far owned three. Would I buy another...yes indeadee. Now, as for Moonlite. My 10-inch Skywatcher collapsible tube dobsonian reflector came with one...and I very much enjoy it. For the price, Moonlite are absolutely fantastic. So you have to ask yourself, do you want style and looks or the best in functionality. Personally I will only go with either Moonlite or Starlight Instruments. Both companies are the best at what they do, and I have used a lot of different focusers. You cannot go wrong with either! BTW, this is my third Moonlite focuser in case you were wondering. I have never owned a Moonlite or even used one. Among my scopes, I have three Feathertouch's, two JMI DX1's, plus three standard GSO standard 2 speed Crayfords. In terms of Eddgie's comments, what is interesting about the JMI DX1's is that the pressure on the pinion bearing is applied by a ball bearing rather than a Teflon or Plastic bearing. The pinion load is adjustable. These focusers are very robust and can handle very heavy loads. Since I never use more than about 3 pounds of eyepiece and Paracorr, I set them up so they are lighter and I also add a heavy knob to the two speed side. One thing most do not realize is that the smoothness in a microfocuser depends on the two speed knob being heavy, most are steel or brass. It damps out the roughness. Whilst I have no experience with a CF2, I have used the Moonlte CLS focuser for the last 5 years and it has never missed a beat even though the imaging train is close to being at its limit. It’s an excellent focuser. Having said that, my current scope was fitted with an FT on purchase , its rated quite a bit higher in capacity and it’s the ducks nuts, as are the other two FT focusers I have..but...the moonlites still won’t miss a beat. Having had a 2" Moonlite focuser for a while now I would say that if you are going to run heavy loads the answer is yes if everything that is said about the FT is accurate. The Moonlite came to me with shipping damage (it was on a ST120) so that required a $100 repair. The service was great and the focuser was returned in excellent working order. However, ever since I tried a 12mm ES92 the Moonlite focuser has an occasional problem where it just sticks. I turn the course and fine focus and there is no movement. I apply pressure while I'm turning and it catches and then works just fine. It is not a major problem, but I did not have it happen until I tried a 35oz eyepiece. If the Moonlite needs repeated repairs from heavy loads then it will quickly become as costly as a Feathertouch. So, I'm happy with the Moonlite - it is buttery smooth when working properly - but I can see where the FT is worth the extra cost. Edited by russell23, 26 March 2019 - 07:01 PM. I am happy as a clam with a old R&P. Some of the mid range scopes with the cheaper new style of focusers i have had gave me trouble more than once. Mine won't see much 2" action or heavy loads. I am a 1.25" guy about 90% of the time. If it is really clear i may slap on the 30mm 82 degree ES monster. Most of my viewing is high power on lunar and planets. So far i like the Moonlite. Only problem i found was when using a heavy 2" 30mm ES it would rotate on it's own. I guess this a reason i never use this eyepiece as it throws balance off on all my scopes and i always have to move the OTA up the rings and adjust the counter weights. But the focuser is super smooth and feels nice to use. They are about as good as you can get. I own two of them: 1 for a 8" reflector and 1 for a 90mm Refractor. Both have the motorized focusing option which is why I selected them over the stock focusers which were just fine for visual use. The Moonlite is ideal for heavy loads like imaging trains. Very precise in its motorized focusing function.